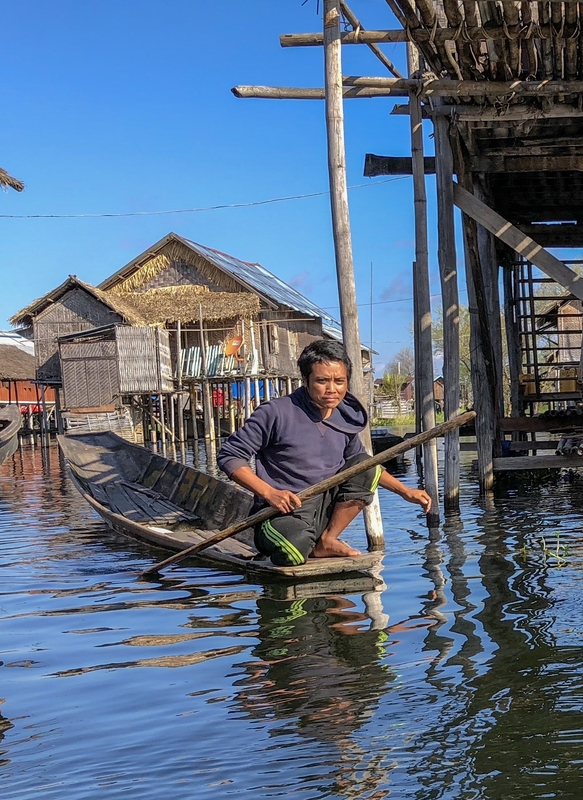 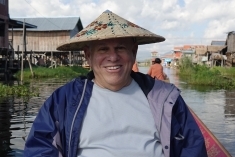 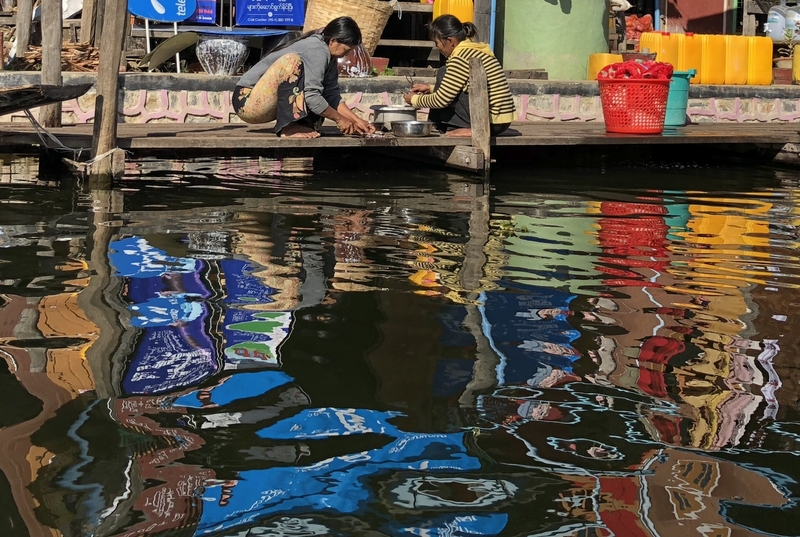 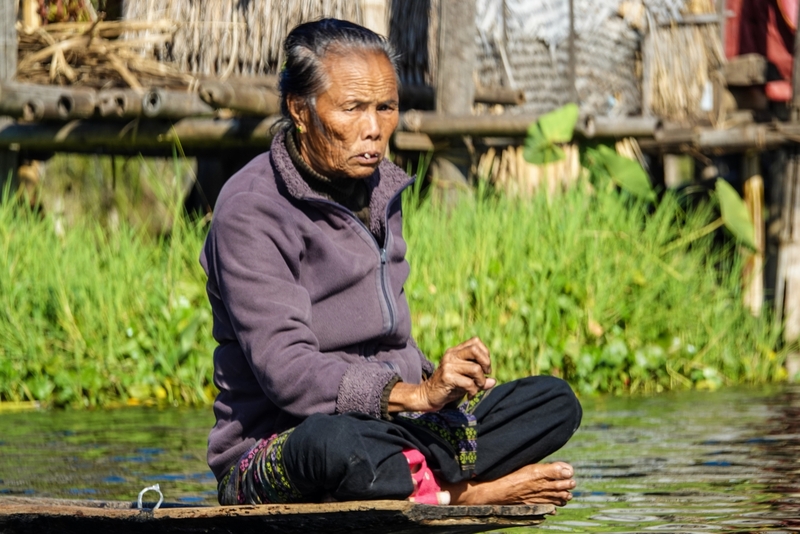 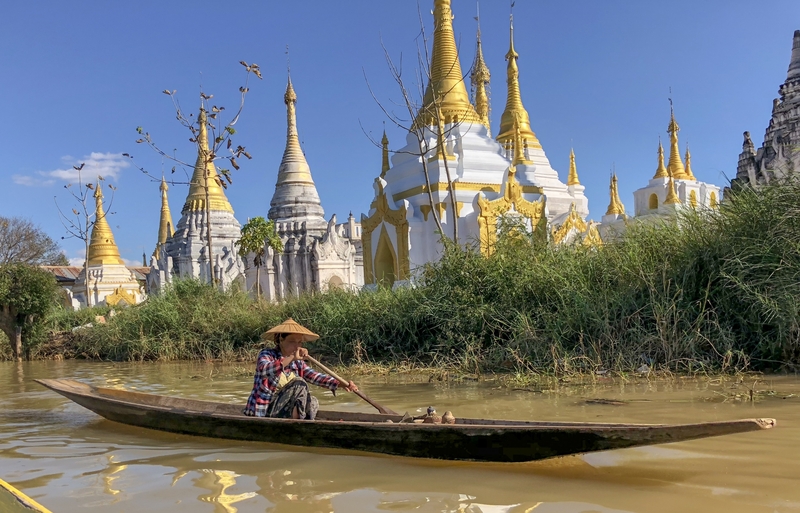 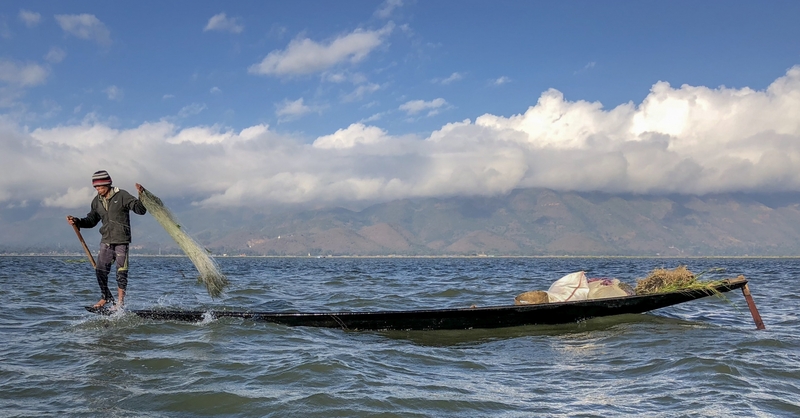 As I entered the wide expanse of Inle Lake at the end of a narrow feeder channel, two fishermen appeared performing what I could best make out as a slow-motion, over-the-water ballet with oars for props—all while balanced on the bows of their boats. It was absolutely enthralling. 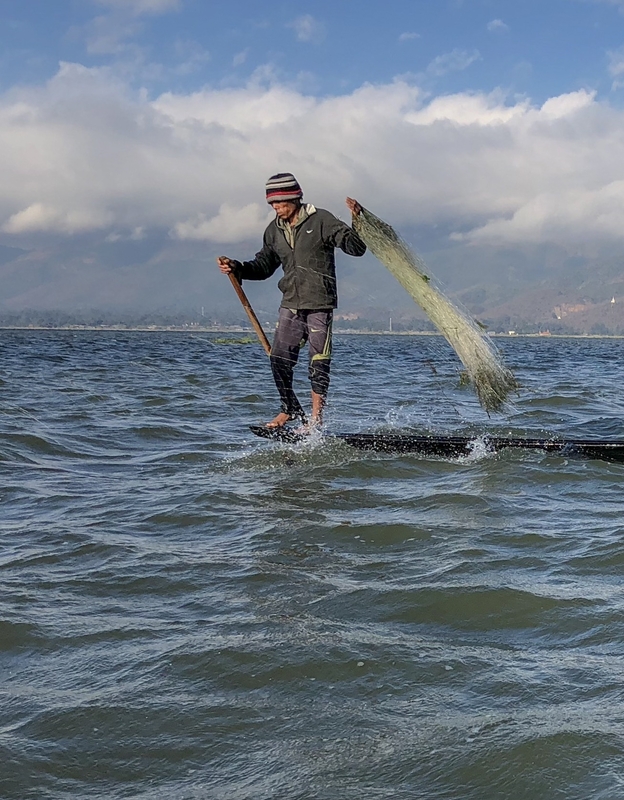 Life on the shallow, 13.5-mile freshwater lake is utterly captivating: With no roads or sidewalks to speak of, locals and visitors alike get around in one-person-wide wooden boats outfitted with outboard propellers, which emit a noisy whine when at full throttle and can be raised and lowered depending on water levels. 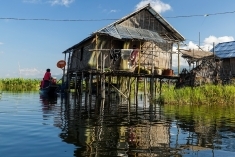 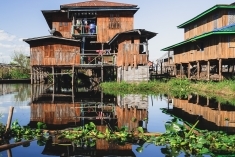 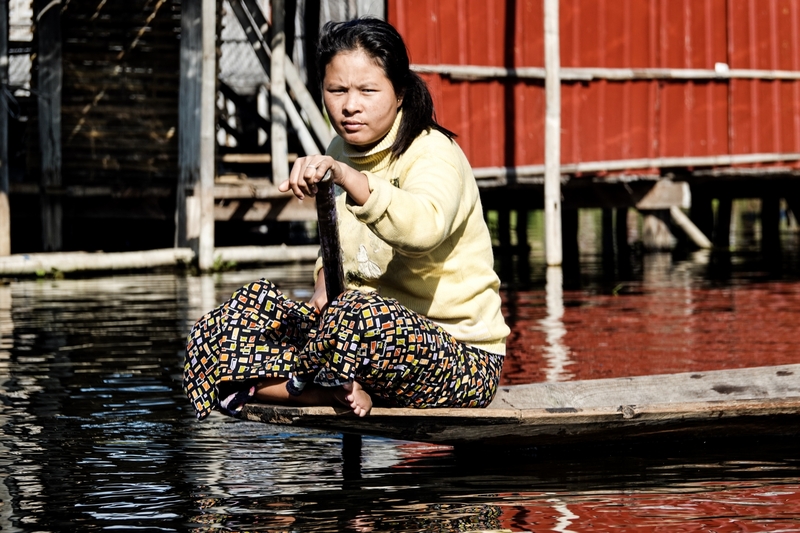 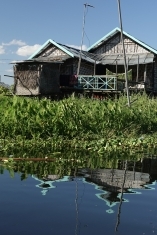 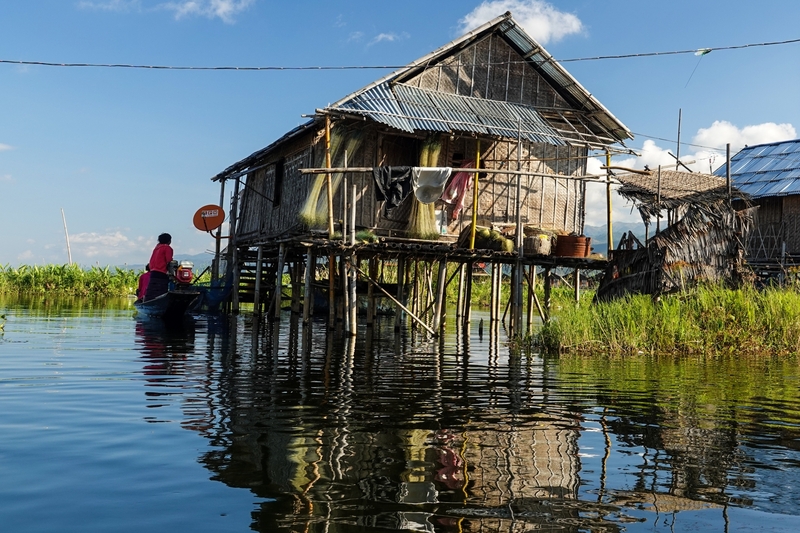 Villages of rustic single- and two-story wooden stilt houses straddle active waterways. 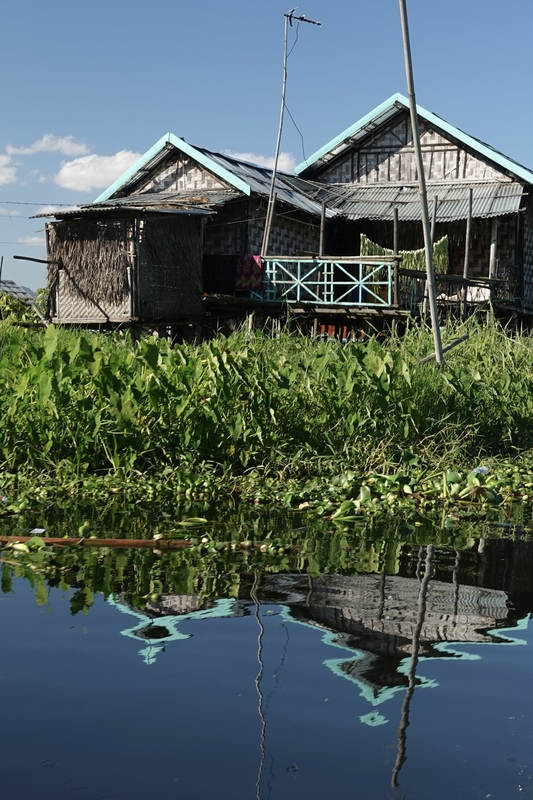 Houses surrounded by the family vegetable gardens in the shallow waters around their house. 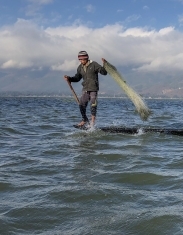 Fishermen work the lake, using a mesmerizing one-legged paddling technique you won’t see anywhere else in the world. Hydroponic tomato farming is also big here, based on an aqua biotic system in use since the 1960s. Cruising along channels hemmed in by floating gardens is simply sublime. 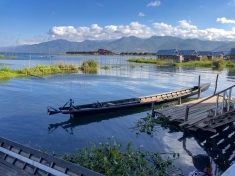 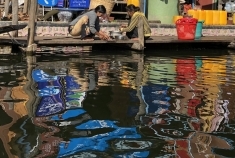 Inle Lake has been a major Myanmar weaving center for over a century. 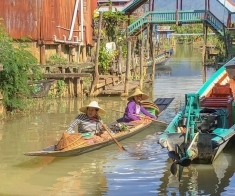 You’ll hear the looms clacking away through open-air windows as you come in to dock. 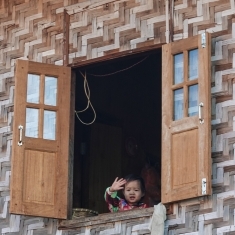 It’s a big enterprise by Myanmar standards, with several tidy buildings housing twenty-plus looms apiece. 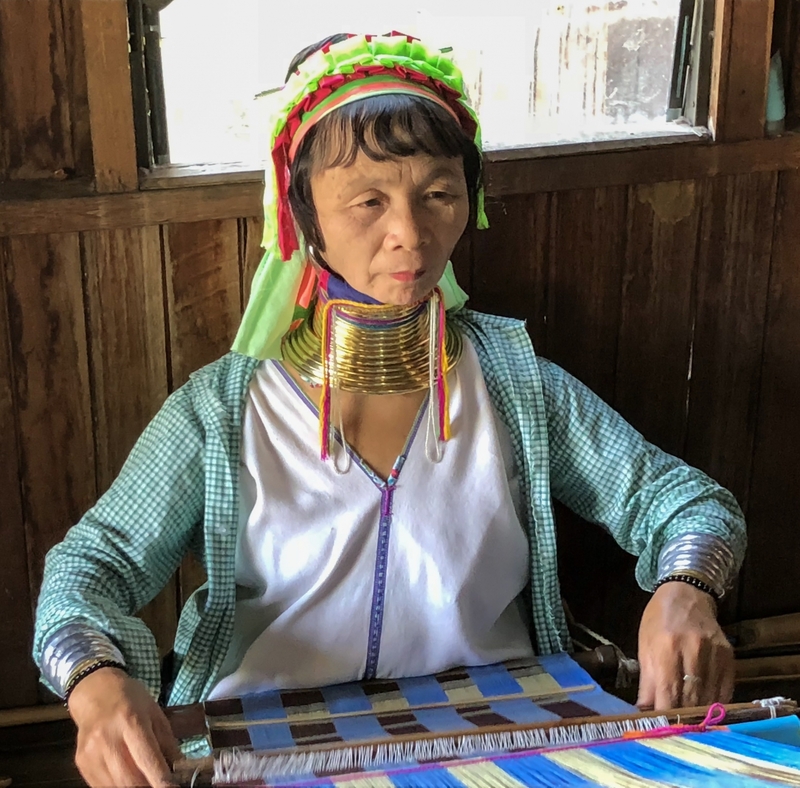 Everything, from the dyes to the finished scarves and longhis (the Myanmar sarong), is done here by hand, by women of all ages (they’re allegedly more precise than men). 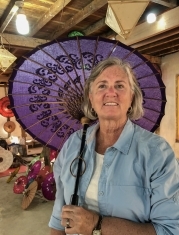 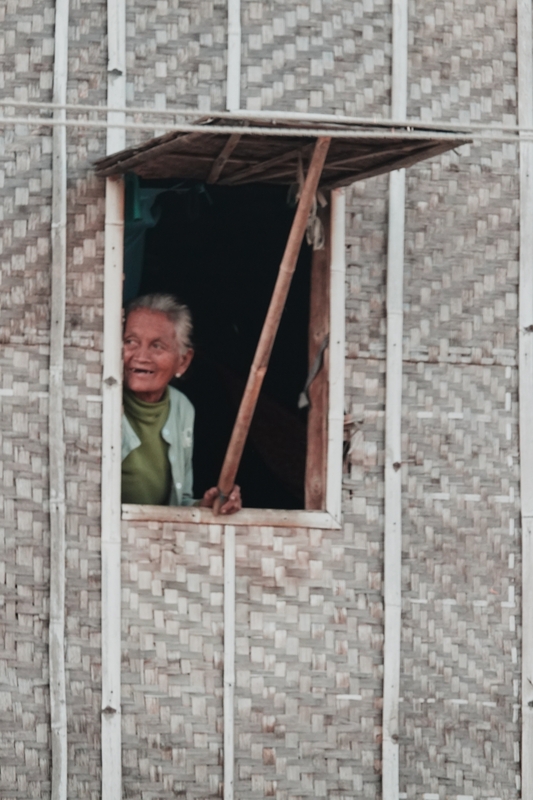 There’s no retiring age, either: The eldest women approve designs and dying techniques, their experience and taste still invaluable, even as their eyes fail on the looms. 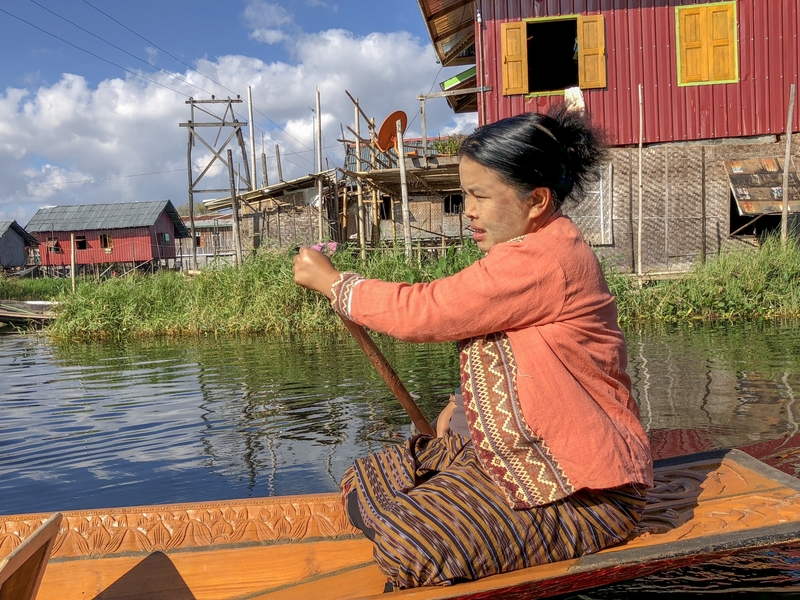 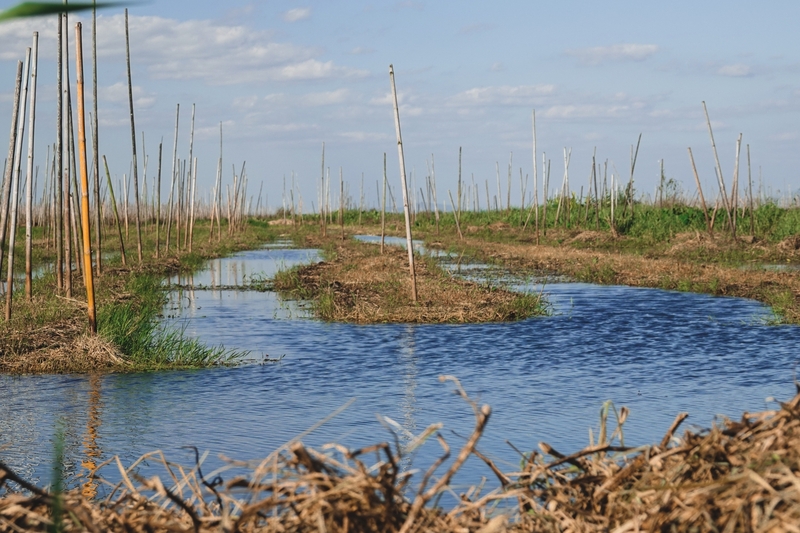 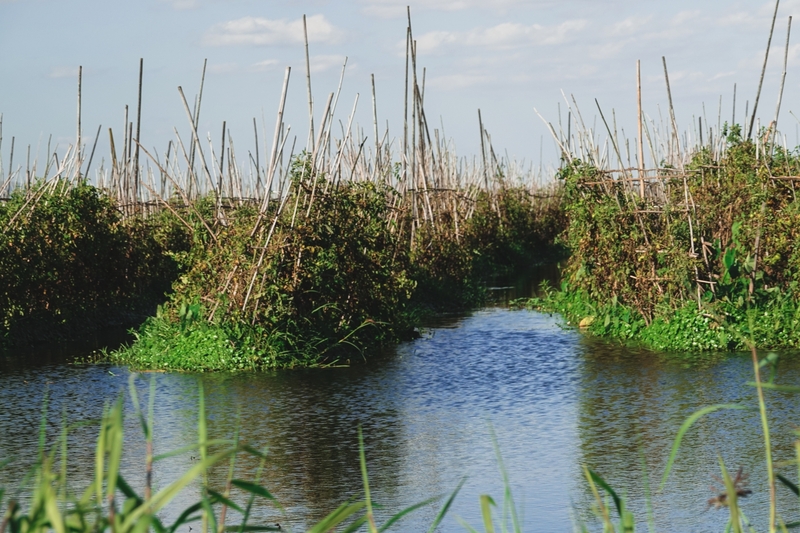 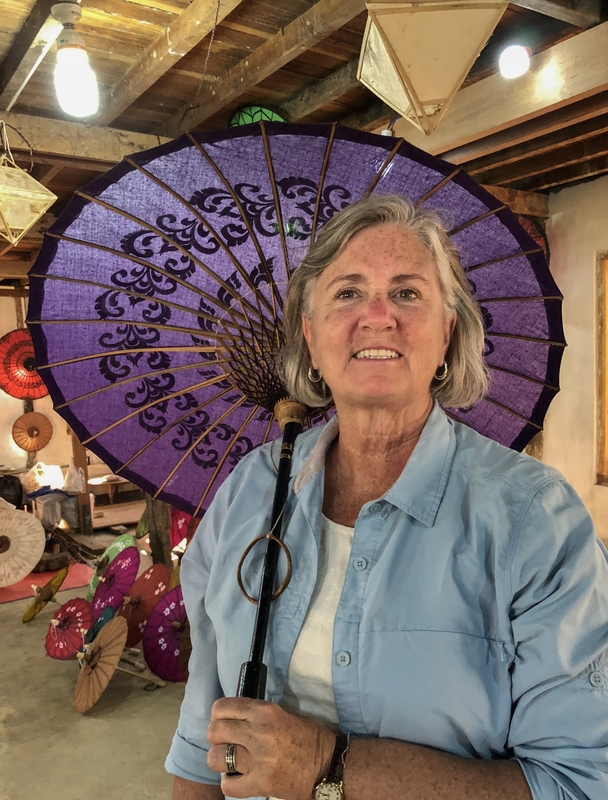 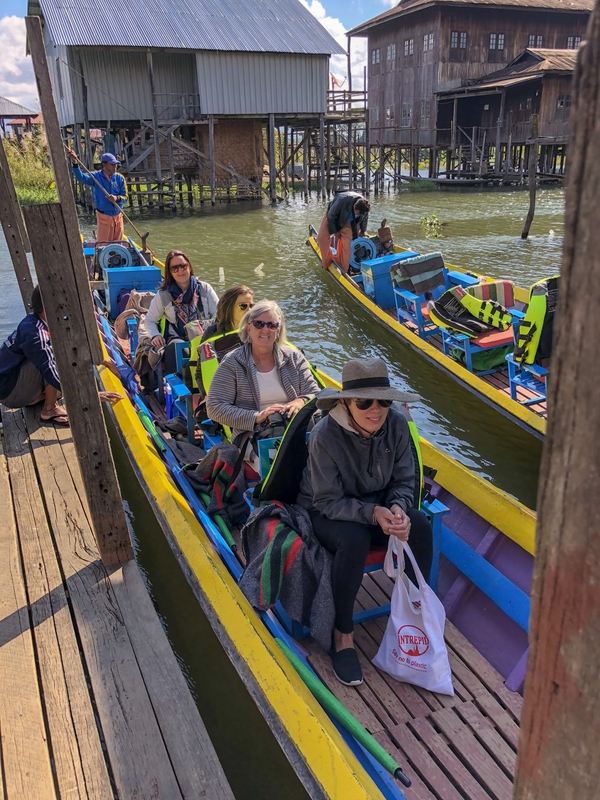 While woven textiles can be found throughout Southeast Asia, Myanmar is the only place to make lotus fabric—and Inle Lake is ground zero for it, as its shallow waters create ideal growing conditions for the flowering plant. 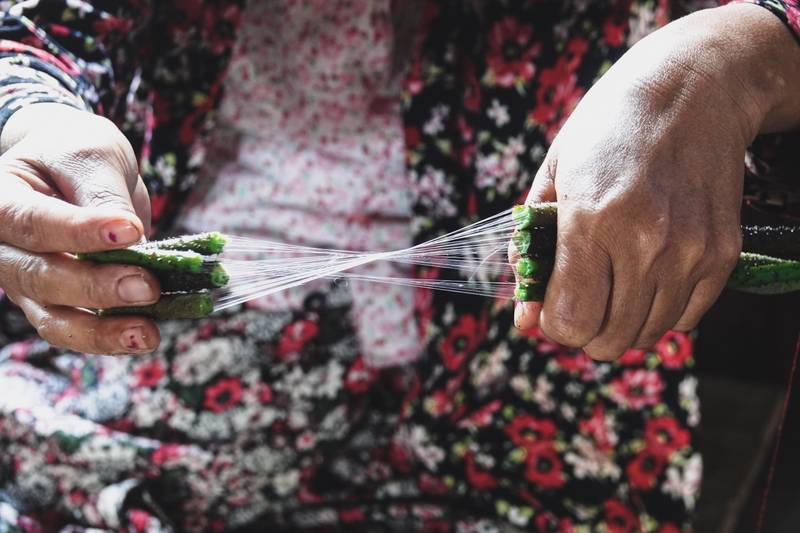 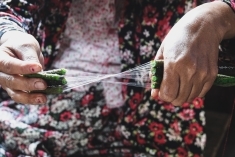 The lotus stem contain fibers which are harvested and twined into one string, which is dried, dyed and used in the weaving of silk and lotus scarfs! The stalks are then replanted to harvest additional lotus flowers and stalks. 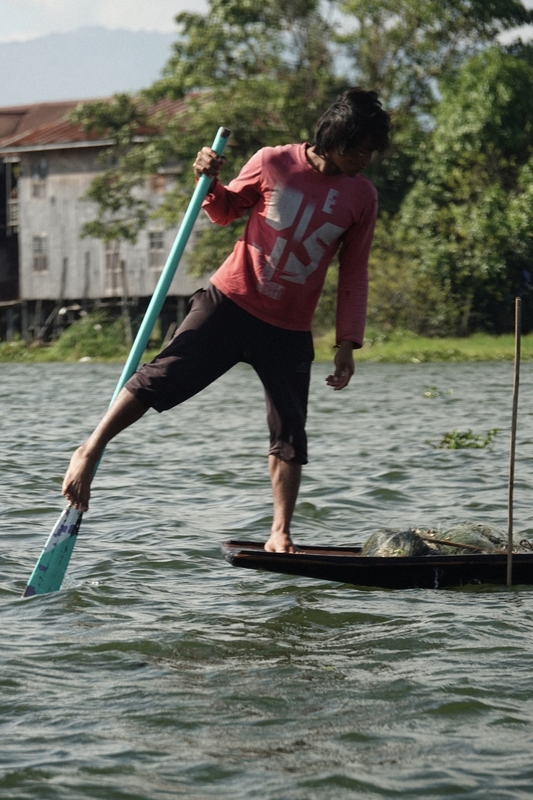 Nothing is waisted here. 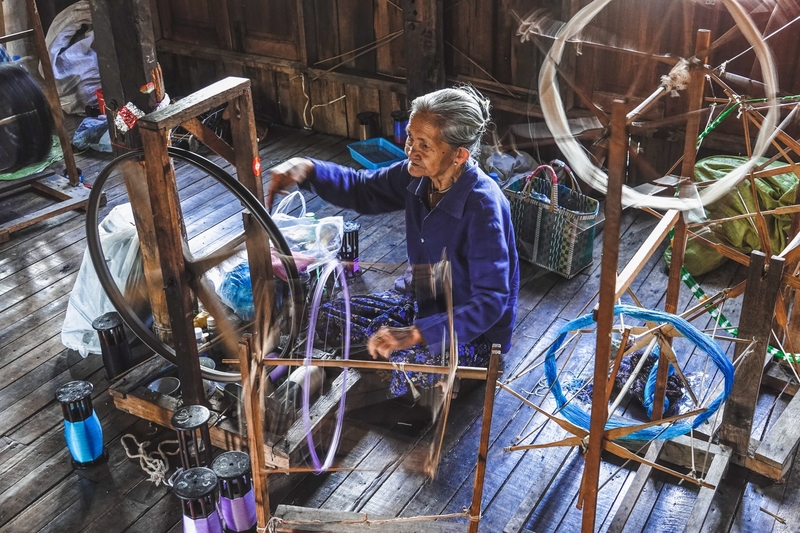 Did you notice the old bicycle wheels as the spinning wheel? Padaung long neck women in Inle Lake also weave scarves and have a cottage industry to earn additional income. 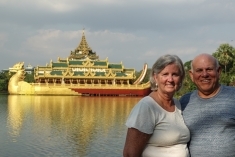 They are happy to visit with people about their lifestyle and customs. 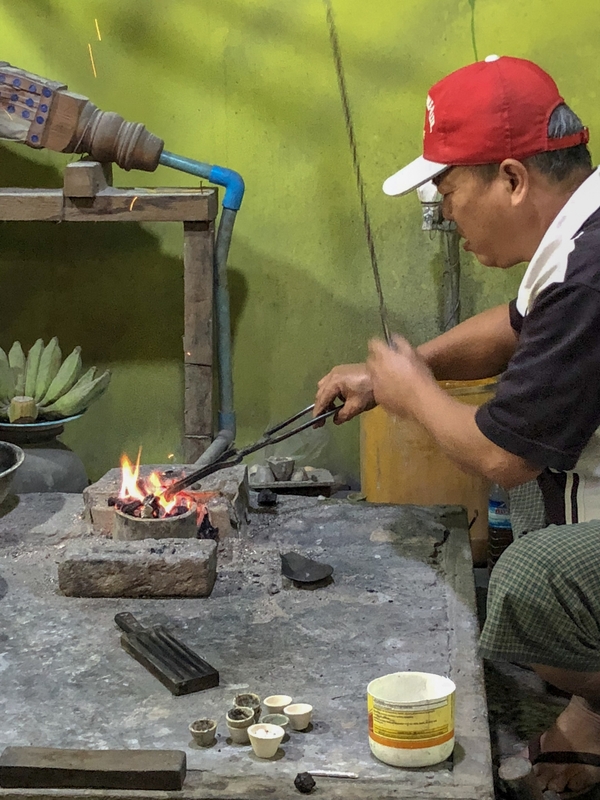 We watched the silversmith explain how they extracted silver from rock and pour the 98.5 percent pure silver into molds. 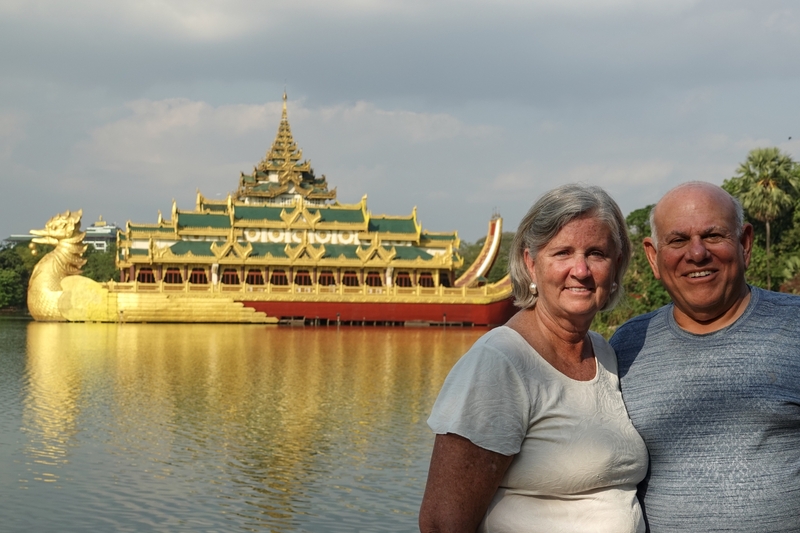 After the demonstration, David and Karen purchased new travel wedding rings. Karen’s hands have swollen with arthritis, so new rings were needed. 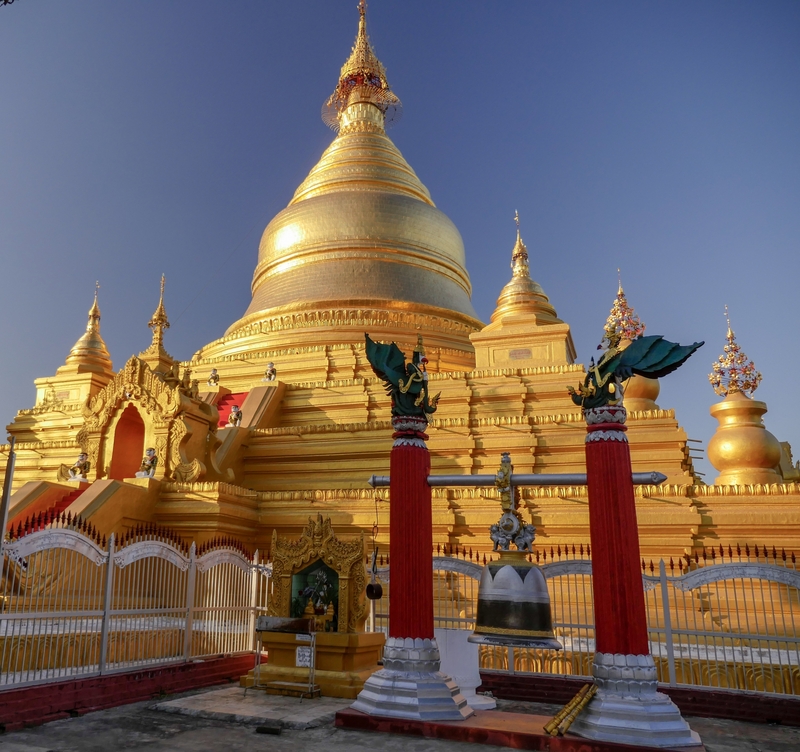 Another highlight of this region is an impressive complex of thousands of crumbling stupas, most constructed in the 17th and 18th centuries, and vary in colors, from earth tones to the restored golden ones which glisten in the afternoon sun. 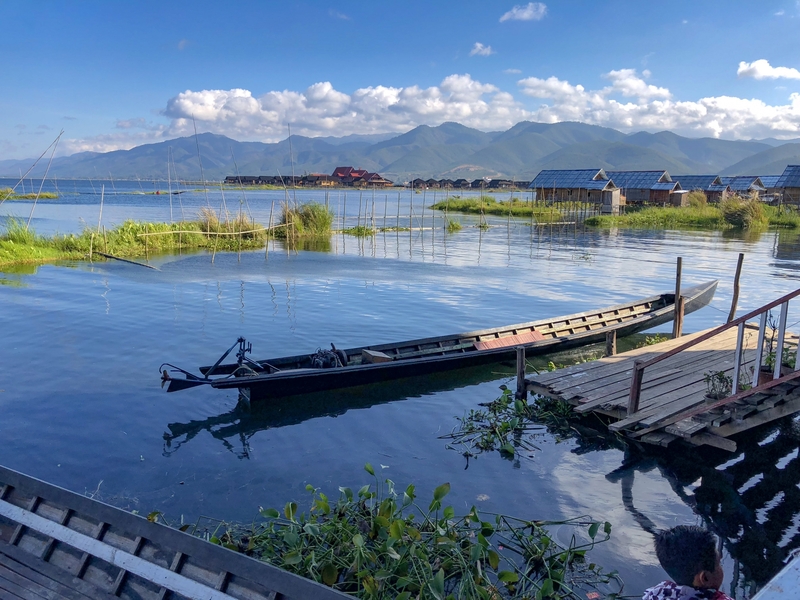 The last event of Inle Lake was our group found a lovely rooftop bar with a fire pit and three pitchers of beer and four pizzas later, our western taste buds were happy. 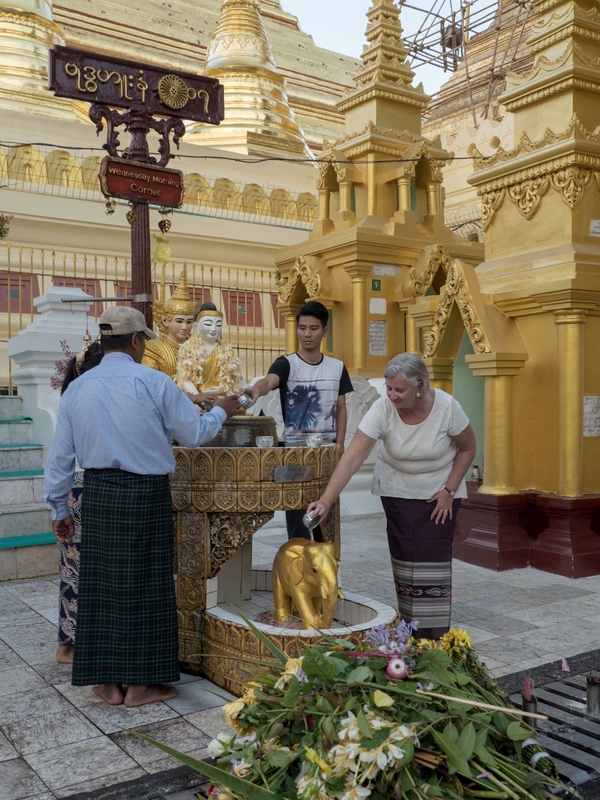 The last day of the tour was spent in Yangon. 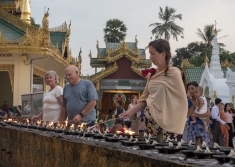 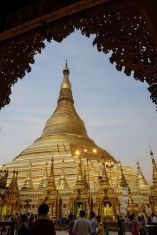 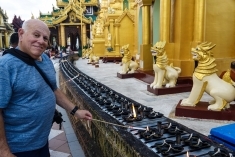 There are two remaining sites to share: the reclining Buddha and Shwedagon Pagoda. 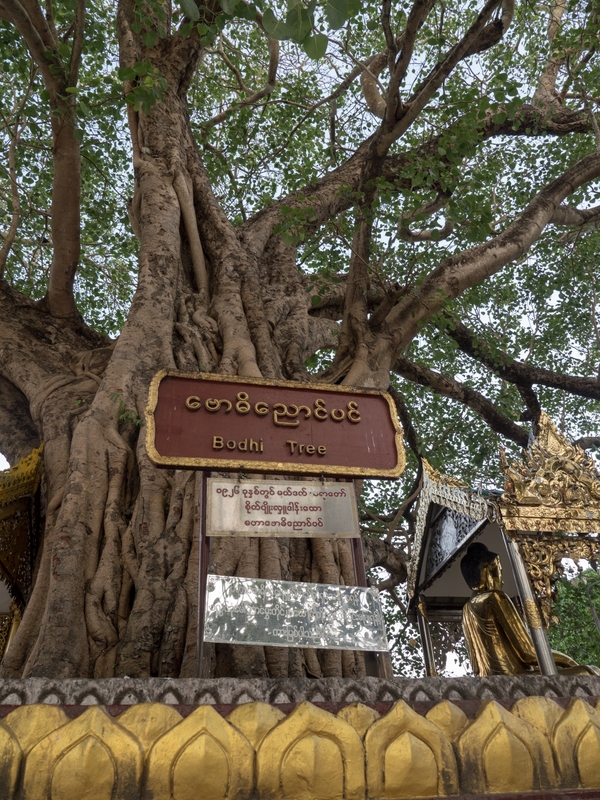 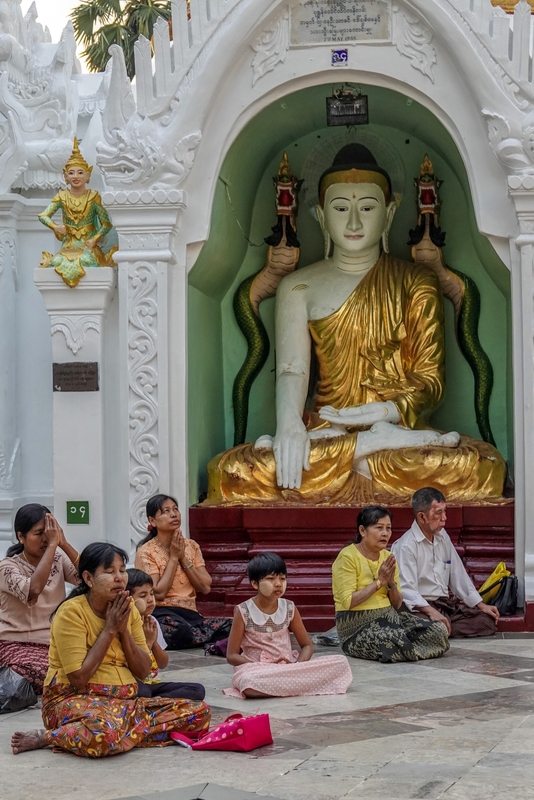 Housed in an open sided steel and corrugated iron structure that looked more likely to host a rock concert, the Buddha gazed down on the handful of Burmese worshippers gathered around at the base of its face. 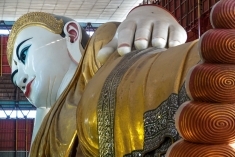 The Buddha itself was quite mesmerizing to look at. 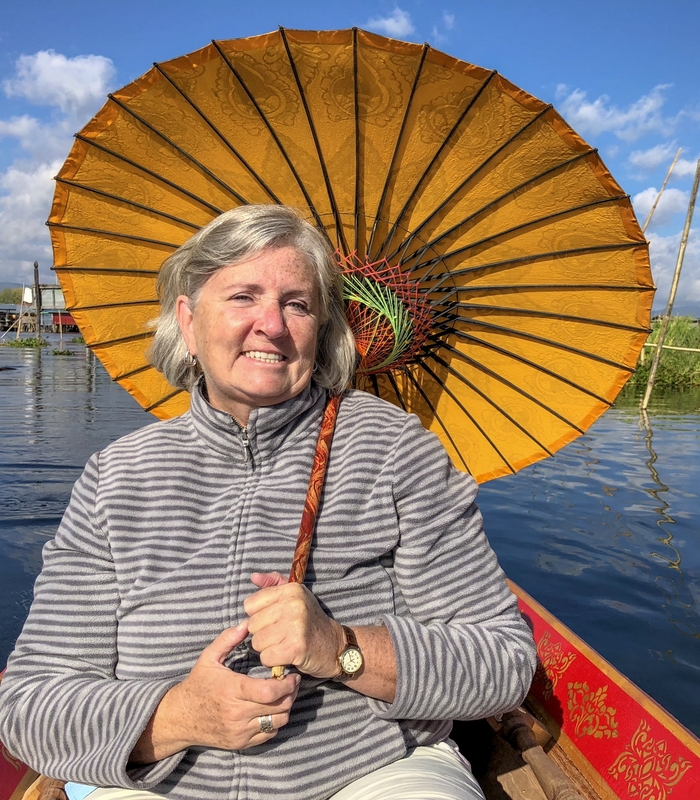 At first I thought it was horribly gaudy, with the bright red lips and white skin and pink toenails – but the more I looked at it, the more it seemed to make sense. Certainly, the amount of photos I took during my hour there indicate how I couldn’t stop looking at the Buddha. 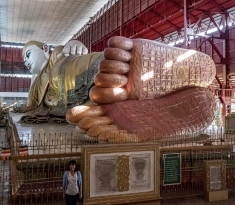 (The length of the pedestal is 230 feet; the circumference of the head is 90 feet). 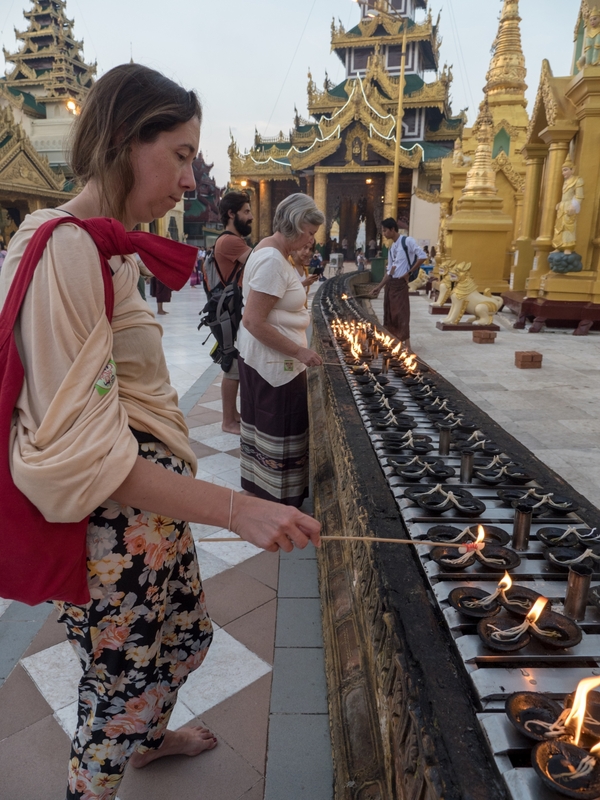 In the afternoon, we visited the 2,500-year-old Shwedagon Pagoda; Burma’s most sacred site enshrining 8 strands of Buddha’s hair and other holy relics. 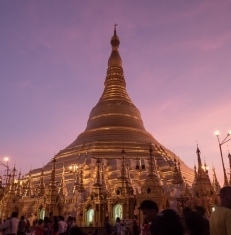 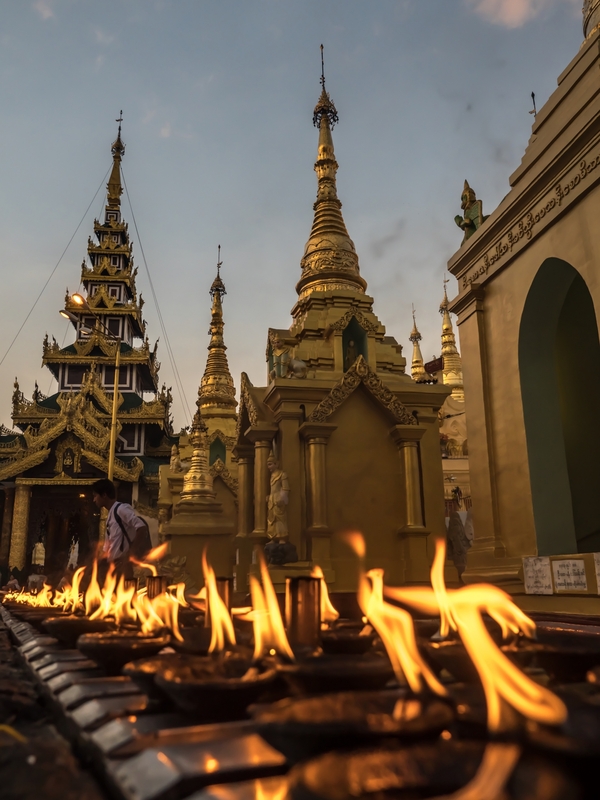 With a base perimeter of 1420 feet and rising 330 feet, Shwedagon Pagoda is plated with 22,000 solid gold bars worth roughly US$ 3.2 billion. 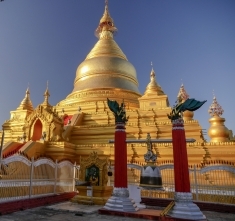 The top of the stupa is encrusted with 4,531 diamonds; the largest 72 carats. Repeatedly damaged by earthquakes over the centuries, the top collapsed in 1768, but such is the importance of Shwedagon that it is repaired again and again, the gold donated by royalty and the wealthy. Reached by four covered walkways guarded by lion-dog statues, the massive central pagoda is surrounded by a complex of hundreds of smaller temples. 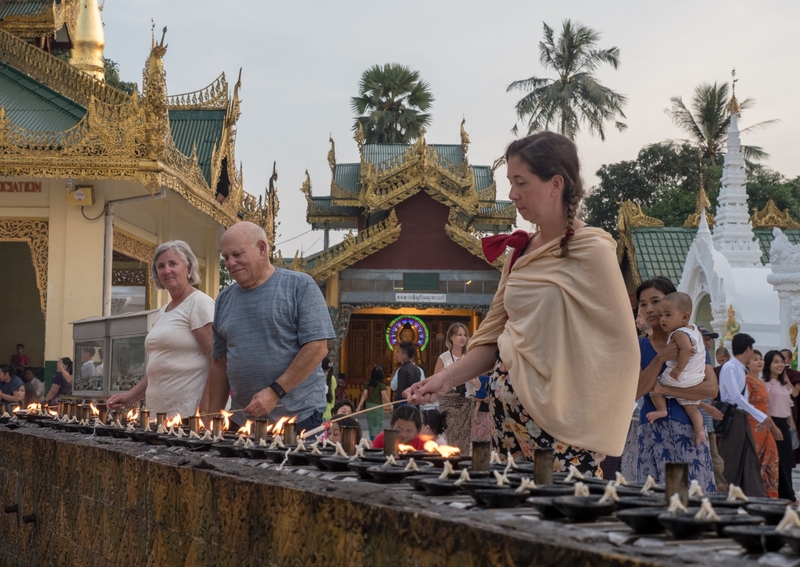 The grounds throng with thousands of families praying, eating, socializing, and sleeping. Yet what makes Shwedagon so special is not its height or gold, but the fact that it is not a monument to past piety but a living expression of it. 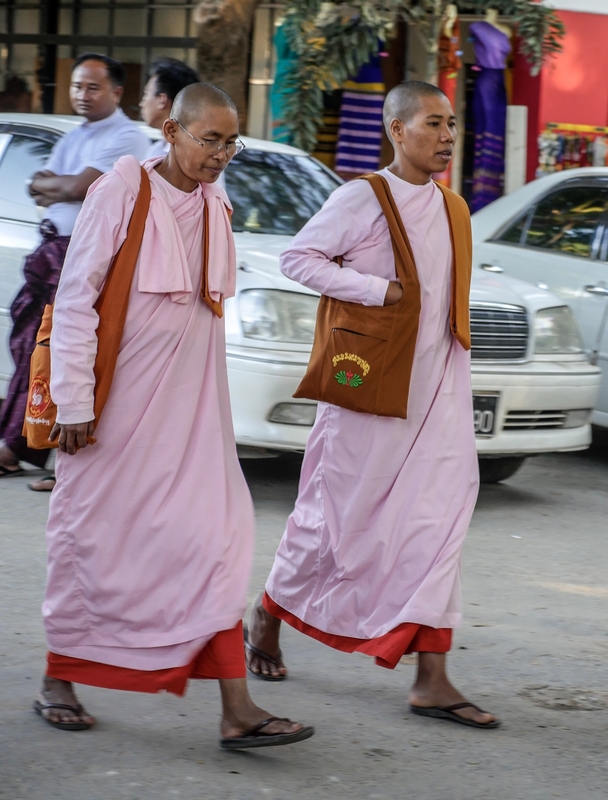 Visitors go to Shwedagon everyday, decked out brightly, walking around the platform with not graveness but gaiety. 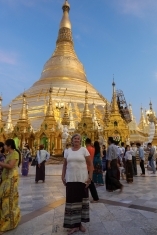 Karen wears her longi, (sarong) a traditional Burmese dress made from silk and cotton. 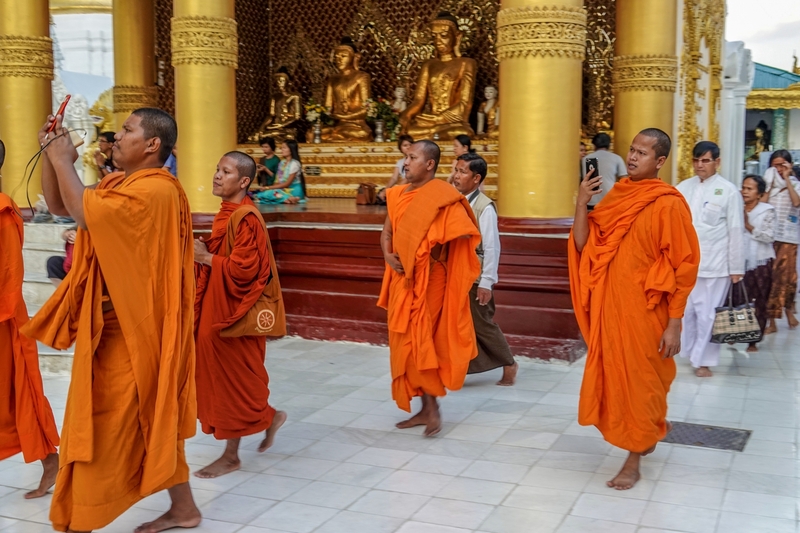 Turning any corner you are as likely to see meditating monks as you are snap-chatting teenagers and toddlers squawking raucously on tottering legs. It is in this communal good cheer, rather than in solemn silence, that Buddhism in Myanmar is most commonly displayed. 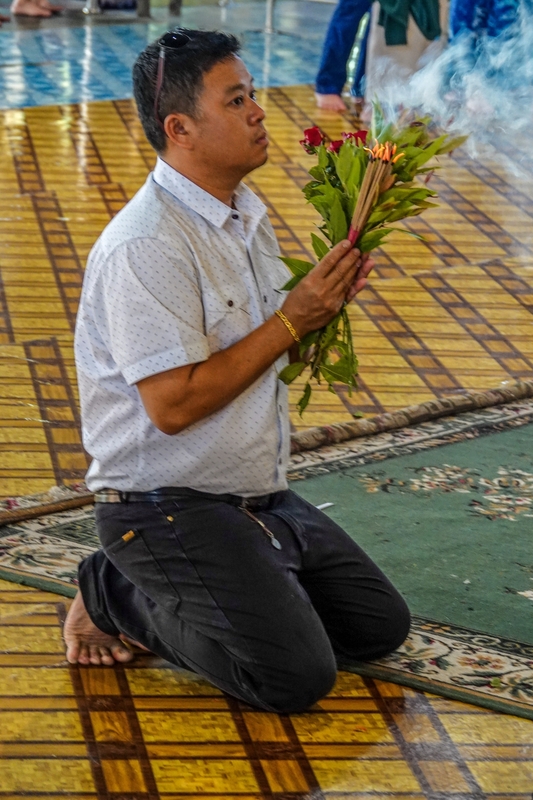 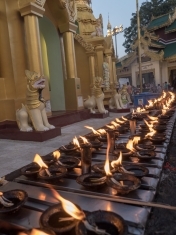 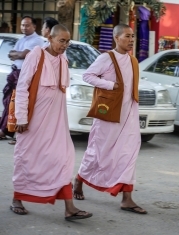 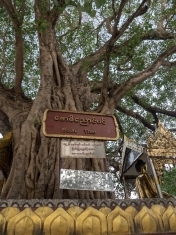 The Theravada Buddhism of Myanmar, has earning merit at its core. 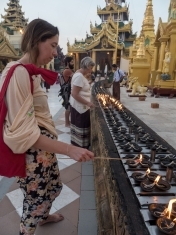 Since we are in one of the world’s most holy Buddhist shrines, we (down to 3 in the group) needed to earn merit! 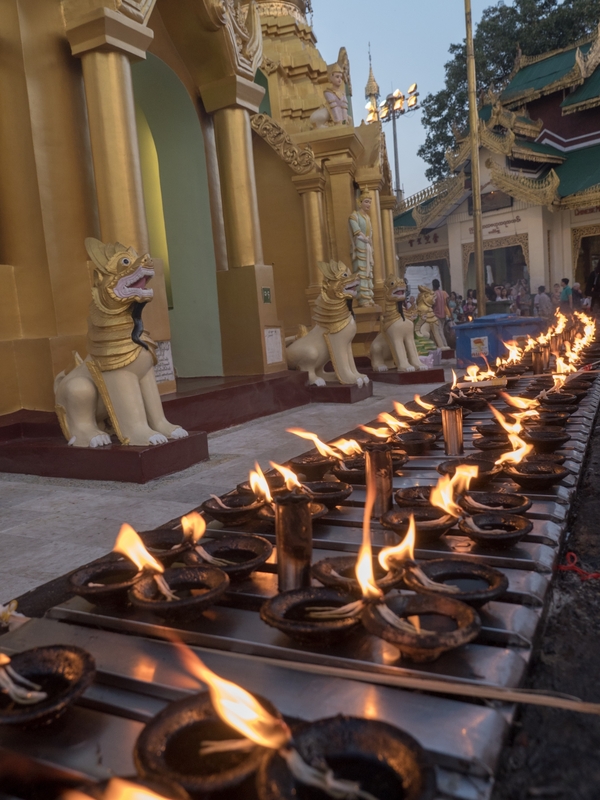 We lit over 200 candles in honor of Buddha. 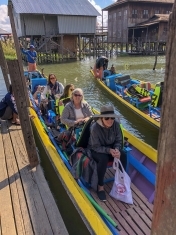 It was really work! 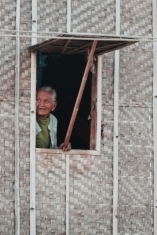 But beautiful in the end that the photos meant something much more tangible.